This will instruct you on the toolbar and how you can input your aerodrome entry. 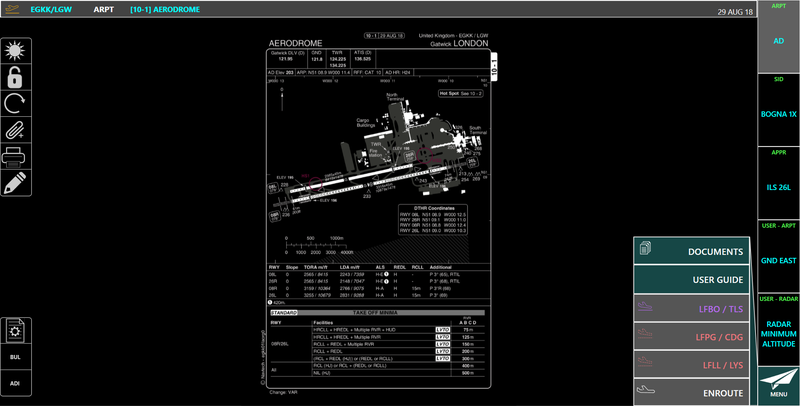 It will also show you how you can reverse your aerodrome and view detailed information about each aerodrome. The route toolbar is located at the top of the enroute screen. 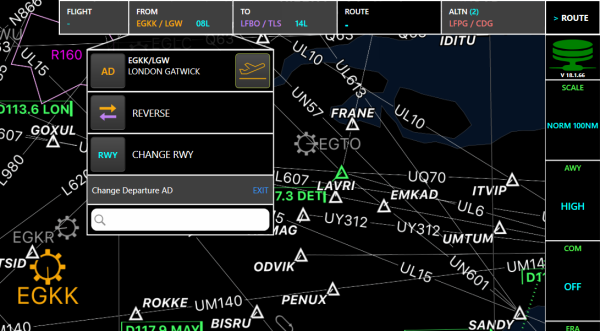 The route toolbar is where you will be able to input your flight information. You will be able to specify your departure (FROM), arrival (TO) and any alternates (ALTN) aerodromes and access their associated terminal chart screens for a quick access to a specific chart. There is also the ability to enter and activate a route manually, this will be explained in a later topic. The route toolbar is broken down into different sections, let's look at each section in more detail. If the route toolbar is not present (if your device is in landscape mode) then you need to select the route button located at the top right of the screen. This button gives you the option to hide the toolbar from your screen. 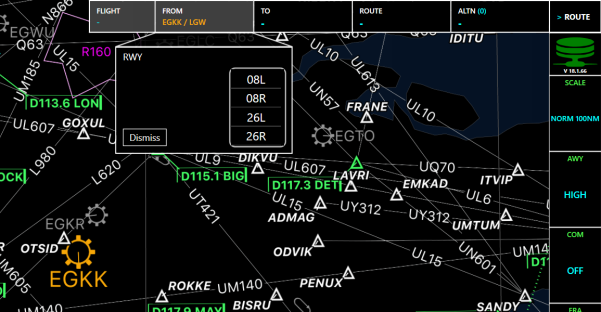 Your route information and any aerodromes your have selected will not be removed if the toolbar is hidden. The FROM is the departure aerodrome. 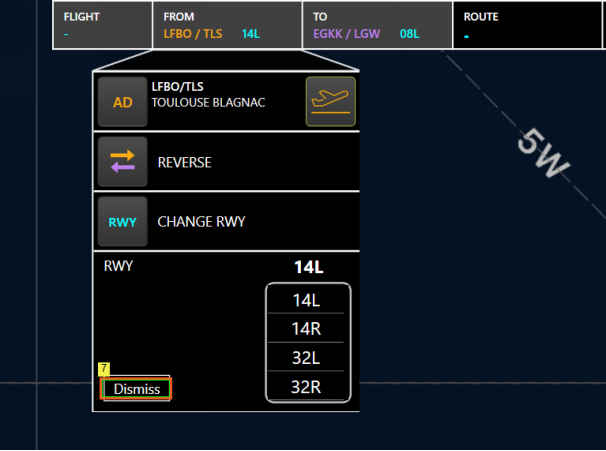 Let's create a route from London Gatwick to Toulouse Blagnac. Click the FROM input field. A search field will show allowing you to enter and search for your aerodrome. 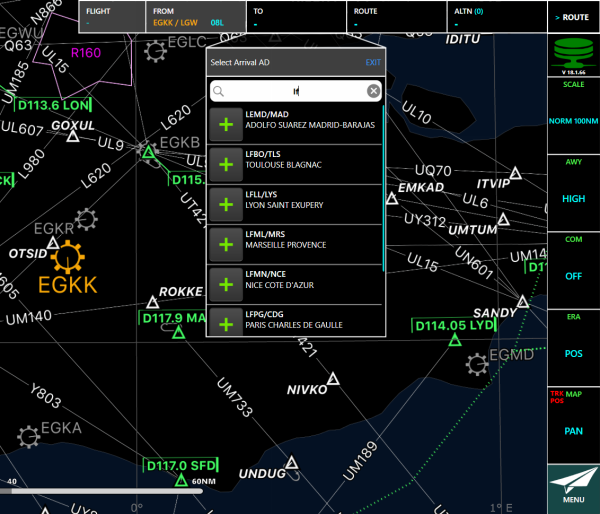 You can search for the aerodromes either by ICAO, IATA code or by aerodrome name. By typing the first two letters of your ICAO, IATA or aerodrome name this will bring up a list of possible aerodrome selections for you to choose. Enter egk into the Search field. Tap the “+” button to add it to your route and the charts screen. Once you have selected your aerodrome you will be asked to select your runway, simply tap on the required runway identifier, if you don't know the runway you plan to use then you can dismiss this section. You will be able to change the runway should you need to, this will be explained later. Click the 08L Runway list item. Now you have the departure aerodrome completed, let's now enter our TO (arrival) aerodrome. Click the TO input field. Enter lf into the Search field. Click the 14L Runway list item. You can clearly see the two airports that you have selected with their corresponding runway. Let's add some alternate airports to our route. Type in your alternate aerodrome here. Your list will be filtered as you start to type. 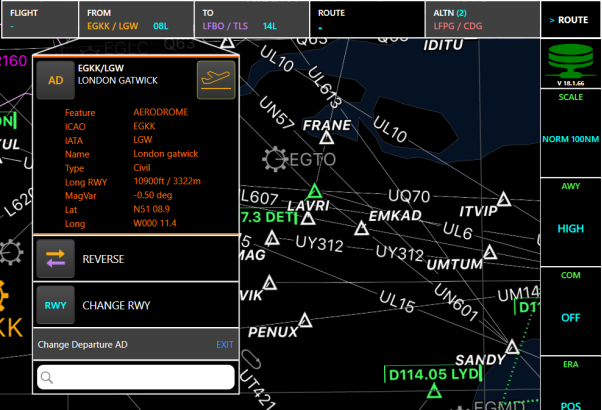 Your chosen FROM, TO and ALTN aerodromes are now visible in the route toolbar. You can select as many alternate aerodromes as you like simply by clicking on the ALTN button. The list of your chosen aerodromes are situated on the left hand side. The edit option will allow you to reorder the list or delete them any of the aerodromes. 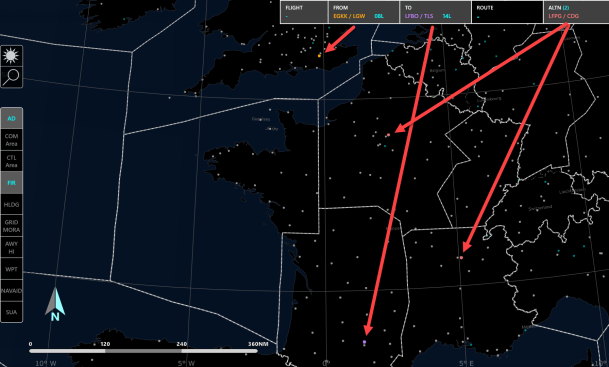 In this example we have two aerodromes selected. 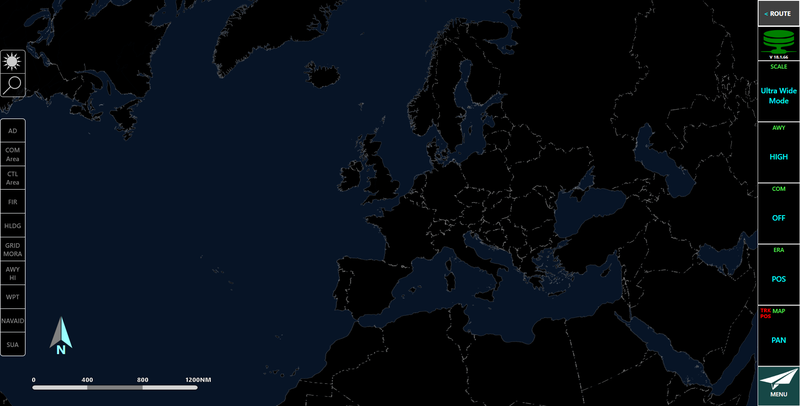 If you zoomed out your chosen aerodromes color will match the location of your aerodromes on the map. Zooming in, the aerodromes will be visible and much larger to read. 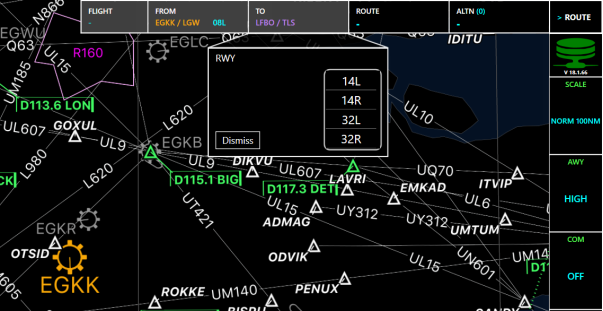 Let's have a look how we can change the runway, aerodromes and how we can view detailed information about our selected aerodromes. Tapping on the orange AD button will move you to the location of the aerodrome in the map and center it. You can see that EGKK is now centered on the map. Let's have a look at some details about this particular aerodrome. Click the FROM EGKK / LGW menu item. Clicking on the aerodrome name will bring up some detailed information for your chosen aerodrome. Click the Aerodrome name button. You can see some details about the aerodrome. Details that include Name, aerodrome reference point, and longest runway information. This will be the same format of information that is available for all aerodromes. Click on this symbol to access the charts. Click the Orange aircraft symbol button. 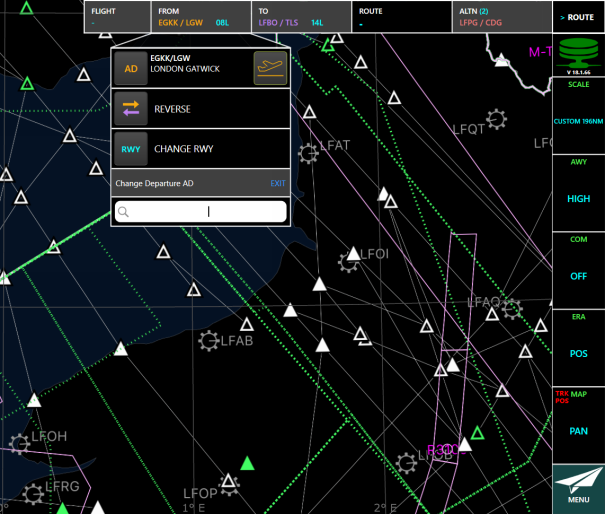 You will now be able to view all the charts related to that aerodrome. Let's go back to the route toolbar. You can reverse your TO and FROM aerodrome using the following button. The reverse button allows you to reverse the FROM (departure) and TO (arrival) aerodromes in the route toolbar. The TO aerodrome moves to FROM and the FROM moves to TO. The button is inactive until you have entered an aerodrome in both locations and you have enabled the reverse option in the settings see NAVBLUE Charts+ Windows settings for more information. Once you have selected the button a warning message will pop up. 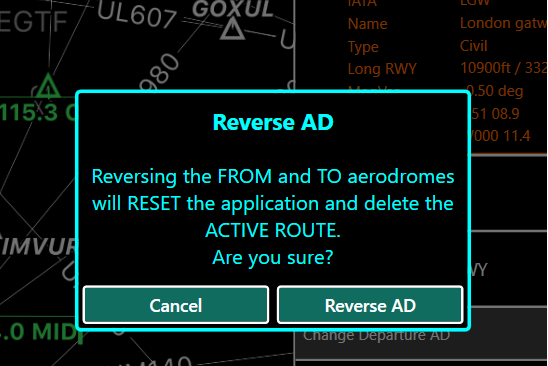 Reversing the aerodromes will reset the application and delete the active route. A warning note will be displayed before you are able to reverse the aerodrome. Now that you have reversed the aerodromes you can clearly see that the FROM aerodrome has been changed from Gatwick to Toulouse. Let's change the runway. Click the Change RWY button. 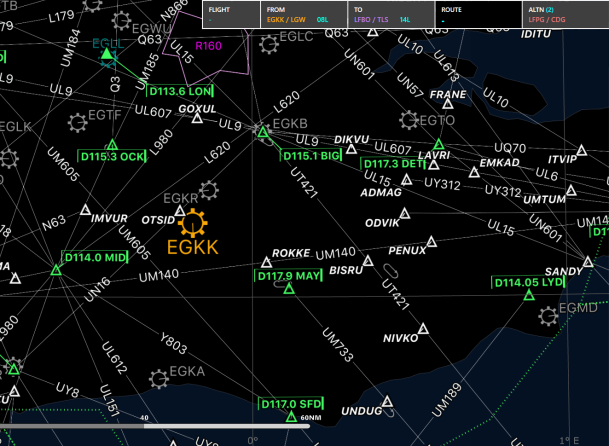 This is the current runway that has been selected, which can also be seen in blue next to your chose aerodromes. The selection of runways that you can choose from your aerodrome. In this example we will leave the runway as 14L and click dismiss. You can check any of the information that you may have changed by referring back to the route toolbar.